In the 1930s and ʼ40s, African Americans who were looking for a night on the town in Los Angeles knew where exactly where to go: Central Avenue. In its heyday, the historic South Central neighborhood was instrumental in the development of West Coast jazz and African American culture. And on Central Avenue, one institution was involved in the community’s daytime and nighttime activities: the Dunbar Hotel. 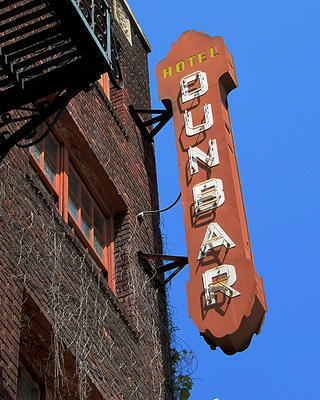 The Dunbar was the finest black hotel in L.A. and for decades the lodging of choice for African American artists, activists, athletes, and more—the hotel was even listed in the Green Book starting in 1939. After a long decline and years of decay, the majestic building with Spanish Revival details has been restored to its place as an economic and cultural anchor of the neighborhood. Today, it’s the center of the Dunbar Village development and offers affordable housing for seniors. The Dunbar opened in 1928 as the Hotel Somerville. 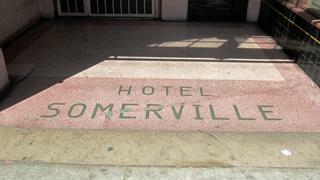 Married couple John and Vada Somerville, affluent and popular African American dentists and civil rights activists in Los Angeles, established the hotel for guests traveling to L.A. for the NAACP’s first West Coast convention in 1928. The Somervilles knew those guests would be denied first-class accommodations elsewhere in the city. John had experienced the same discrimination when he first came to California from his birthplace in the West Indies; he wrote about it in his autobiography and named it as a source of inspiration for the project. The Hotel Somerville was a hit. Its African American ownership and luxury made it a point of pride for black Angelenos, and it became “an instant landmark,” according to the L.A. Conservancy. It held art exhibitions and hosted intellectuals for other conventions. But after the stock market crashed in 1929, the Somervilles lost the hotel. Lucius Lomax, another prominent African American, bought the building and renamed it in honor of poet Paul Laurence Dunbar. From there, its role as a hub for black life and entertainment on Central Avenue only increased. The Dunbar's original name was Hotel Somerville, shown in this view in 2010. In 1931, the rechristened Dunbar Hotel acquired a cabaret license and opened a nightclub with live music, which was immediately popular; dozens of soon-to-be-famous black artists played there. During that decade, the Dunbar played host to so many prominent people that a 1974 press release from the L.A. Municipal Arts Department claimed “almost every prominent black entertainer and athlete stayed at the hotel during its first years.” Its nomination to the National Register of Historic Places mentions Duke Ellington, Louis Armstrong, Billie Holliday, W.E.B. Du Bois, Thurgood Marshall, Langston Hughes, Sojourner Truth, and Josephine Baker as performers or guests, among many others. It was also right next to the legendary Club Alabam and close to the clubs and venues around Central Avenue and 41st Street. Ironically, the legal and social victories of the Civil Rights movement spelled bad news for the Dunbar. As new options for both permanent housing and temporary lodging opened across the city, African Americans searching for economic and social mobility moved out of South Central. Jazz performers and overnight guests could play and stay in similar or even more comfort elsewhere, and the Dunbar had newfound competition. Historians and local reporters also note the role that the Los Angeles Police Department played in discouraging white and black people from mingling together on Central Avenue; according to many oral accounts, the LAPD raided jazz clubs and broke up gatherings regularly. The Dunbar struggled to stay open in a changing world with changing demographics. By the 1970s, jazz fell out of fashion, and the population changes that would make South Central the majority-Latino neighborhood it is today began. Finally, in 1974, it closed for good. The Dunbar's iconic sign as seen in 2010. That was just the beginning of a long decline: The hotel stayed vacant until 1990, when it reopened as low-income housing, but loans piled up, the building decayed, and the property foreclosed in 2008. It languished, again, until public and private groups came together to save it. Los Angeles councilwoman Jan Perry pushed for the redevelopment and Thomas Safran & Associates, in partnership with the Coalition for Responsible Community Development, took on the nearly $30 million renovation of the hotel. Withee Malcolm Architects oversaw the adaptive reuse project, undoing ill-conceived renovations from the past and converting the hotel into retail and living space; Steven Fader Architects assisted with the historic preservation work. 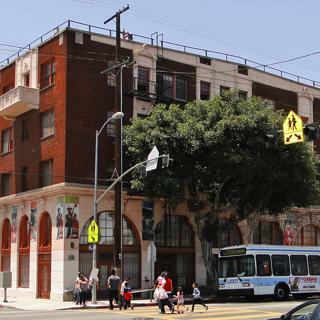 The finished rehabilitation won the project a 2014 preservation award from the Los Angeles Conservancy. Today, the Dunbar Hotel is the centerpiece of the mixed-use Dunbar Village development. The hotel itself contains 41 units of affordable housing for seniors and a restaurant downstairs; the other buildings, Somerville North and South (named to honor John and Vada), have 42 two-, three-, and four-bedroom units. Delicious at the Dunbar—the restaurant that opened in the hotel—is a perfect example of the renewed hotel’s significance to the community, she continues. “It’s a beautiful restaurant. It’s got a full-service bar, and on the weekends, paying homage to the past, they have live music. It’s a nice restaurant, and it’s not particularly expensive. That says they know something about the history, since they’re serving Mexican and Southern food,” she says. It’s the first full-service restaurant to open in the neighborhood in two decades, according to Eater.